Charlotte von Mahlsdorf (18 March 1928 – 30 April 2002) was the founder of the Gründerzeit Museum (a museum of everyday items) in Berlin-Mahlsdorf. Bruno Vogel (1898–1987) was a German pacifist and writer. Friedrich Radszuweit (born 15 April 1876- 15 March 1932) was a German manager, publisher, and author. Thomas Grossmann (born June 1, 1951 in Hamburg, Germany) is a psychologist, psychotherapist and author. 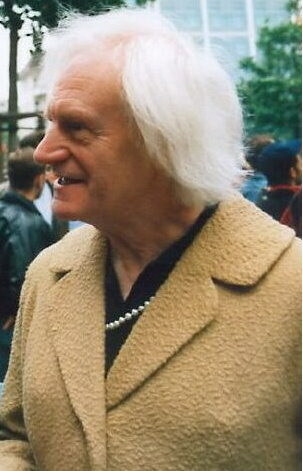 Rüdiger Lautmann (born December 22, 1935) is a German professor of sociology and one of the most prominent LGBT scholars in Germany. David Berger (born March 8, 1968 in Würzburg) is a German theologian, author and gay activist. Manuela Kay (born 1964 in Berlin) is a German lesbian journalist, writer, film-maker, and magazine editor. Monika Treut (born April 6, 1954 in Mönchengladbach) is a German filmmaker. Joseph Friedrich Abert (June 11, 1879 - October 25, 1959, in Würzburg) was a German historian and archivist.